The degree of assistance of robotic systems can be divided into three levels, which correspond to three stages of loss or deterioration of the user’s motor and/or cognitive skills: a first level when the stimulation is required to maintain the level of user activity; the second corresponds to the need for rehabilitation when these capabilities are reduced hampering independent living; the third level includes the assistance needs when the loss of capacity requires continued assistance to maintain independent living or to mitigate staffing needs assistance. These three levels involve the study and development of robotic systems that imply physical interaction with the user, and the need to discern and act according to their status and their wishes or needs. Robotics brings new possibilities to increase the capabilities of multisensory integration, increasing perceptual capacity, which is essential for developing strategies for more intelligent and efficient control and performance. In this context, robotic performance can range from manipulation of objects in the environment, to the integration of robotic systems on the body itself, either orthotic devices, or a wide range of equipment to support walking, guidance etc. The AURORA project, continuation of the research of the two participating teams and their previous cooperation in the fields of interpretative perception and performance adapted to the user needs, brings a new value by proposing the study and development of health care systems endowed with elements with distributed intelligence to implement more intelligent systems, more efficient in response time and interpretation ability, and therefore offering greater capacity for cooperation or assistance. The aim is, to achieve greater parallelism, and even redundancy, to attain more efficiency, and also more reliability to be able to estimate degrees of confidence and establish, when necessary, less optimal control strategies, or even in degraded mode. Significantly advance in systems with reactive, compliant, efficient and reliable interaction to operate in high security environments (used in medical settings). Go deep in increasing the capacity of human-robot cooperation, its interface and virtual reality. Fulfillment of the developed rehabilitation and assistance demonstrators. Development of new algorithms to estimate the state, intention, and affective state of the user, based on combination of biosignals (EEG, EoG, Gaze, ECG). Development of multimodal interfaces, adaptive and proactive, in function of the analysis of the information provided by the different distributed systems. Study of the generation of continuous functions based on interpretation and learning of gestures and situations for the feedback of control systems in biomechanical environments. Funded: Fundació Privada Cellex and Fundació bancària “La Caixa”. Partners: Fetal I+D of BC Nata (Hospital Clínic and Hospital Sant Joan de Déu), Universitat Pompeu Fabra, Universitat Politècnica de Catalunya, Institut de Bioenginyeria de Catalunya, Institut Químic de Sàrria. The Project aimed to improve fetal surgery procedures is composed of 4 subprojects: Medical Image, Optical Biosensors, Robotics and Biosensors and Biomaterials. 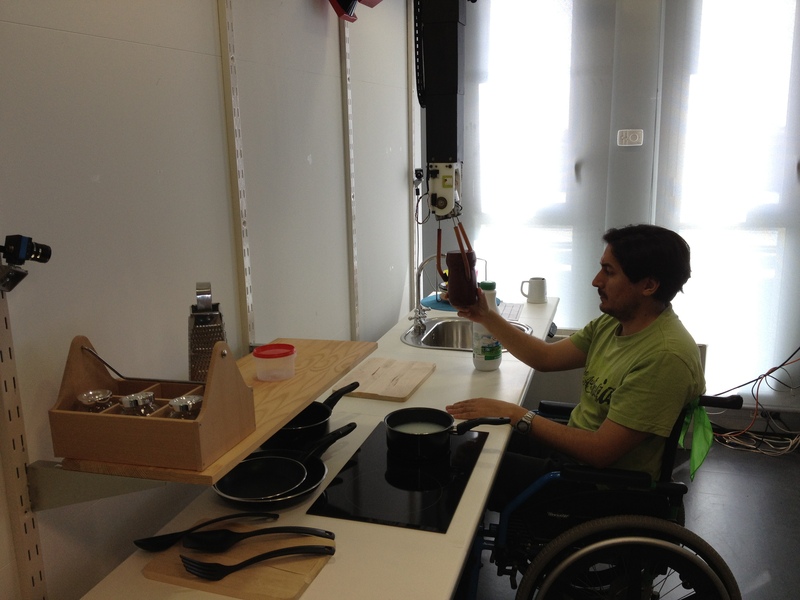 The UPC team is developing an assisted motorized trocar to assist the surgeon in a cooperative way. 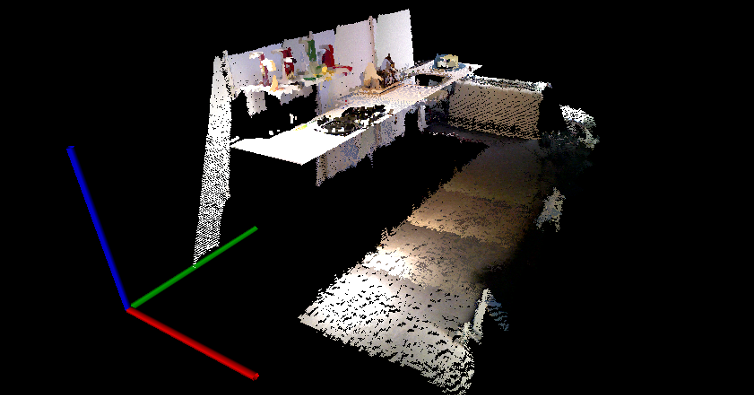 The robotic system is assistance guided by images and the application of virtual fixtures and tracking techniques. The two surgeries considered in these three year period are twin-to-twin transfusion syndrome and diaphragmatic hernia. Promoting or restoring walk in children with motor disorders is one of the main objectives of physiotherapy in the frame of rehabilitation treatment. 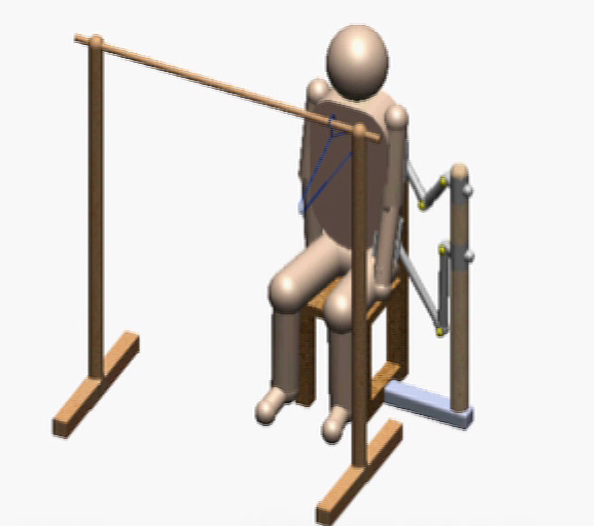 The proposed system relies on providing a treadmill with a motorized handle, which allow controlling the degree of support of the patient on the belt, and of two retractable arms that allow helping from the foot to complete the controlled walking movements, just holding the feet of the patient. This system, controlled by a computer, differs from classical systems in that it does not provide the patient with a complete lower limb orthotics, which can force the whole movement of the joints of the limbs. It is proposed to study the degree of applicability of a simplified actuation based solely on the feet control, which will depend on the type and severity of affectation of patients. The movement would be controlled downwards through the treadmill belt and upwards through the two retractile robotic arms. These arms would be endowed with two degrees of freedom to achieve guiding. 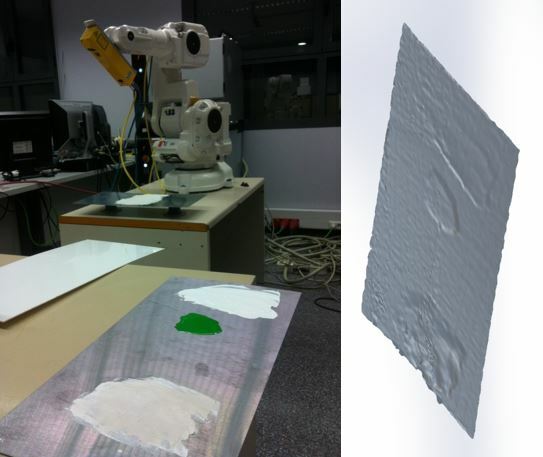 The problem of scanning a large surface while polishing requires either the use of huge robots or using an industrial robot on a mobile base. The precise positioning along a large surface requires specific positioning systems. The visual analysis of the surface provides data of surface flaws allowing the automatic polishing strategy. Contract with EMTE Systems. Este proyecto, con el código de referencia: IPT-2012-0321-020000, ha sido cofinanciado por el Ministerio de Economía y Competividad, dentro de la línea instrumental de Articulación e Internacionalización del Sistema, en el marco del Plan Nacional de Investigación Científica, Desarrollo e Innovación Tecnológica 2008-2011. De acuerdo con las instrucciones de publicidad: “En proyectos cofinanciados con cargo al fondo FEDER, para dar cumplimiento a las obligaciones de publicidad recogidas en el artículo 23 de la Orden CIN/699/2011 de 23 de marzo, deberán seguirse las instrucciones recogidas en el documento Manual de procedimientos para satisfacer las obligaciones sobre publicidad y comunicación de los beneficiarios de ayudas gestionadas por la DGIC, disponible a través de www.micinn.es en el enlace de FONDOS DE LA UNIÓN EUROPEA. La mención a la cofinanciación se hace de acuerdo con lo establecido en el Reglamento (CE) nº 1828/2006 de la Comisión, de 8 de diciembre de 2006 y al Reglamento (CE) nº 1083/2006 del Consejo, de 11 de julio de 2006, y con inclusión del emblema de la UE. 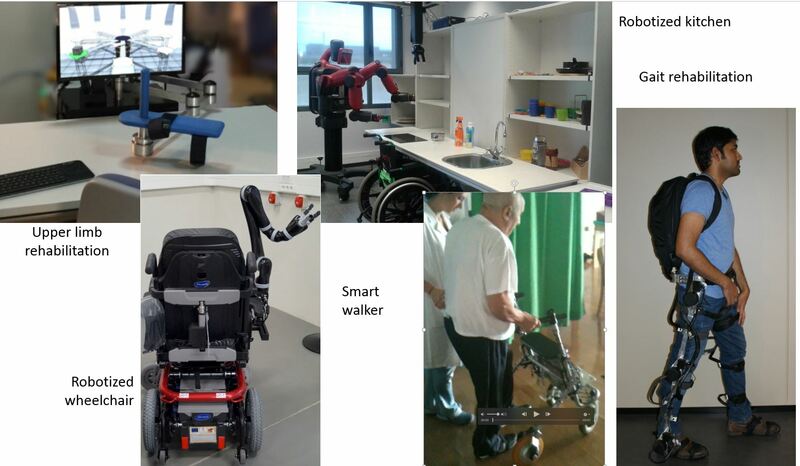 The main purpose of the InHANDS project is the study, development and implementation of a robotic hyper-flexible cell in the context of a domestic environment to assist impaired or/and elder people. The InHANDS scenario will be composed of a set of actuators (including robots), cameras, sensors and advanced human-system interfaces connected through a network. Domestic environments are unstructured and can be affected by many unexpected situations that require a higher intelligence control and coordination between all devices present in the scenario. 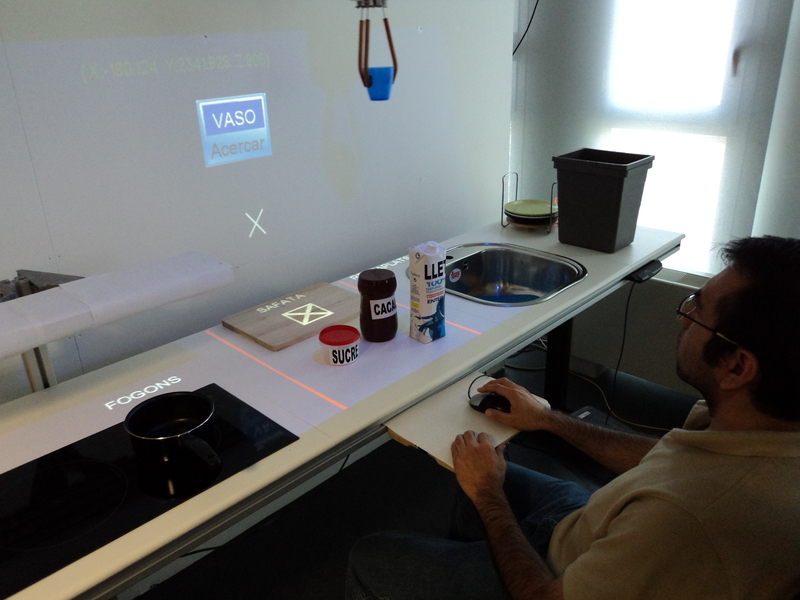 The main interest of the project lies on providing to such robotized environment with the necessary intelligence level that allows its users to interact with the system in the simplest and most natural way, overcoming one of the main drawbacks that impedes a higher widespread of technology to society: human-machine interaction. Therefore, the main scientific contribution of the project is the development of a visual perception system able to interpret in real time the state of the elements present in the environment and obtain the position and gestures of a user interacting with this environment. From this information, a posterior phase will recognize and interpret human activity through a sequence of “activity patterns”, so as the robot and other active components of the kitchen can cooperate with the user. Divergences from established patterns will be considered as abnormal situations that should initiate a communication between the user and the robot to reorient their actuation. In the long term, this dynamic environment must learn about users’ habits and even anticipate to their orders or be ready for them. The performance of the Internet depends on the interaction of upstream, contents and downstream markets. The development of market power, its abuse and anti-competitive behaviour in any one sector will have important implications for the operations of all others. We focus on developing the knowledge and tools to understand the related markets for: long distance transit; public peering; and broadband access. We also focus on the interplay between infrastructure and contents, which defines the broadband diffusion modalities across Europe. We will study these markets to identify the appropriate tools to deal with market failures. This requires monitoring the evolution of the Internet architecture using data from Online transit markets and from Internet Exchange Points. These represent major organisational innovations in the European Internet and their analysis plays a crucial role in achieving low cost broadband access. These transformations also have wider implications for extending the geographical scope of cheap access towards less developed regions. Our study will help to implement the EU directive on Electronic Networks in identifying best practices for network access. Our consortium focuses on the active involvement of both academic researchers and industry operators. Our objectives support the implementations of both the 'Broadband for all' objective, to enable a wider deployment of the information and knowledge-based society and economy and the 'Networked businesses and governments' objective 'to develop ICTs supporting organisational networking, process integration, and sharing of resources. This shall enable networked organisations, ..., to build faster and more effective partnerships and alliances'. Moreover CoCombine will be instrumental to the IST strategic objective 'to overcome weaknesses in areas which are critical for European competitiveness' by helping safeguarding the competitiveness of the European Internet while strengthening its profitability. This project is oriented to advance in human-robot cooperation and interaction issues, especially in the medical field. Here we consider both surgeon-robot interaction in surgical applications, as well as user-robot interaction in assistance and rehabilitation. Thus the project focus on the human-robot interaction problem, on the one hand considering perception techniques, being either based on contact or remote sensing. Touch perception can be of mechanical type (position, force and touch sensors) or electrical (biofeedback). 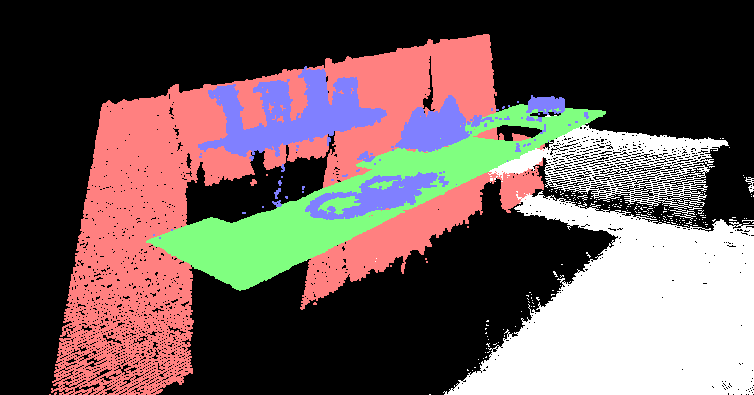 Remote perception is based generally on optical techniques, either based on video cameras or on scanning laser. On the other hand, considers an intelligent interpretation of the perceived information, which carries with it either the integration of multimodal information, as the analysis of its temporal evolution, with which the users’ gesture, intention or action is interpreted. A learning process aiming to progressively incorporate new robot behaviours that provide more intelligent actuation is also a need, in order to facilitate future works to be carried out progressively. Coordinated Action in the field of Computer and Robot Assisted Surgery (CRAS). CRAS is an area receiving broad attention world wide, because of the strong demand for the potential of this technology in achieving new levels of citizen healthcare. Being the goal of the project to devise an integration methodology for the efforts of all research and manufacturing players in CRAS, facilitating the development of new products and allowing European research and manufacturing to lead in the emerging new field of Cognitive Robotic Surgery. In this line, our role is provide grounds for policy making with respect to regulations and certification processes that would ease the deployment of commercial products. The HYPER Project intends to represent a breakthrough in the research of neurorobotic (NR) and motor neuroprosthetic (MNP) devices in close cooperation with the human body, both for rehabilitation and functional compensation of motor disorders in activities of daily living. The project focusses its activities on new wearable NR-MNP systems that will combine biological and artificial structures in order to overcome the major limitations of current rehabilitation solutions for the particular case of Cerebrovascular Accident (CVA), Cerebral Palsy (CP) and Spinal Cord Injury (SCI). The main objectives of the project are to restore motor function in SCI patients through functional compensation and to promote motor control re-learning in patients suffering from CVA and CP by means of an integrated use of neurorobotics and neuroprosthetics. The project will both functionally and clinically validate the concept of developing hybrid NR-MNP systems for rehabilitation and functional compensation of motor disorders, under the assist-as-needed paradigm. In the HYPER view, we assume that the improvement of physical rehabilitation therapies depends on achieving oom 303a more interrelated and transparent communication between the human system and the machines, and therefore, different levels of human neural activity are explored. The project addresses key questions at the frontier of knowledge in various scientific and technological disciplines. These questions are investigated in six research tracks (biomechanics, neuromotor control, control technologies, actuator sensors and powering technologies, multimodal brain machine interfaces, adaptations of hybrid systems to application scenarios) with horizontal interrelationships. The progressive introduction of technological equipment in the operating room (O.R.) has changed drastically many surgical procedures and the evolution of the working conditions in the O.R. In this context, robotics constitutes a new technology having a slow but progressive progress in this area. In a collaboration frame between the two research teams, from the medical and from the technological point of view respectively, the project’s goal is to explore and to find solutions that make compatible the introduction of new equipment in the O.R, to support the surgeon and his medical team, with the operativity in this environment. The aim is to improve current technological aids, by means of robotics, and at the same time have more room available for the medical personnel, so as to be able to operate with more adequate ergonomically conditions. 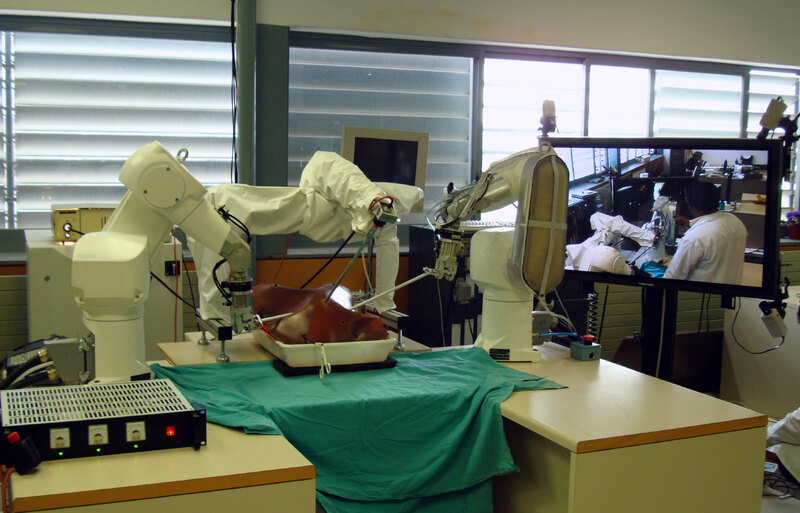 This project consists in the design of a multirobot platform to support multiple operations to be performed during a surgical intervention, in such a way that the robot arms can operate either individually or in cooperation, interacting with the medical personnel and minimizing non desired interferences with them in what refers to the occupancy of the operative space in the O.R. The medical contribution consists in identifying, defining and evaluating the functions to be carried out with the robots support. The scientific-technical contribution will consist in the design of a redundant robotic structure that is versatile, light and of low cost. It will also comprise the development of multirobot cooperation and human –robot interaction strategies. 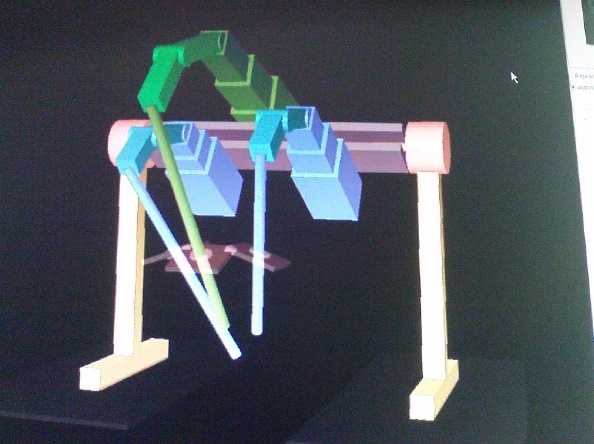 Schema of a three arms robot installed over the operating bed. The project: Modelització de sistemes electromecànics per a l’automatització, la sonorització i la monitorització en rehabilitació funcional (Neurorehabilitació_3E+D) constitutes a preliminary study for a further development af a sensorized and robotized system of assistance in neurophysiological rehabilitation of the upper limbs. The aim of the project is to identify the main specifications: user’s needs, sensing, textile types, actuators and functionality, including the final design of an orthesis. The responsibility of the CREB team is the design of the orthosis based on analysis of possible robot architectures.